Our core Toybankers Nutan Raj and Jyoti Bhat have been incredibly managing the Play sessions at Asha Kiran centres every Saturday. A bunch of young and enthusiastic students from Mukesh Patel School of Technology Management & Engineering (MPSTME) have also been supporting us since July, 2012 by conducting play sessions and different activities for the children at our Play Centre in Asha Kiran. 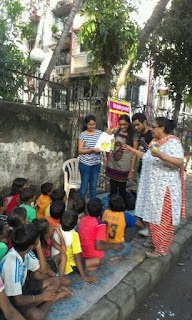 The vibrant team of Toybankers conducted a book reading session with the kids at Asha Kiran on 8th of September, 2012 - World Literacy Day. They read a book called 'Susheela's Kolams' shared with us by Pratham Books. The book reading was followed by a rangoli design activity where the children made colourful sample rangolis on small cards. 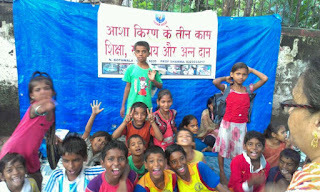 The children as well as the volunteers enjoyed the sessions immensely. "In the past few weeks we got to know a lot about the children. Since the very first day the excitement they showed whenever we came was really amazing. We made good use of all the toys in the Play centre and interacted with the children here. After a busy schedule of studies for both the children and for us, these play sessions are like stress busters, plus it is a 2 way learning experience for all of us who attend these sessions. Apart from the play sessions we also teach them many English songs with actions and they really enjoy singing and dancing with us. Every visit is memorable and something different. The kids always welcome us with a lot of excitement on their face and would ask us to wait for longer and come back soon again." Join us at the play sessions at Asha Kiran every Saturday between 3.30pm to 5pm.